Nicolas Cage had a good run of films in the nineties and after the critical successes of films like Wild At Heart and Leaving Las Vegas, Cage reinvented himself with a run of action films. The next three films Cage was in are perhaps three of my all time favourite films; The Rock, Con Air and Face/Off. Other wise known as the Holy Trinity of cinema, but whatever. For me this was the peak of Cage’s career, and he’s still not quite got back to being this good. Yet. Today I’m reviewing Con Air, perhaps the more hilarious of the Cage action trilogy. Cage plays Cameron Poe, an army vet who is sent to prison after killing a man in self-defense. After serving eight years Poe is released and is heading home to see his wife and his eight year old daughter who he has never seen. But disaster strikes when other convicts steal the prison plane and only Cameron Poe can stop them. Nicolas Cage’s performance as Cameron Poe could be read as being both good and bad, depending on your tolerance of Cage’s equally ridiculous hair and accent. Why they made Cage, a California native, into a southern Alabama red neck is beyond me, but when the whole film is ridiculous this really doesn’t stand out. Con Air also stars other great actors along side Cage, including John Malkovich as insane villain Cyrus ‘The Virus’. He’s hams it up as much as Cage and turns in an extremely memorable performance. Other characters include Diamond Dog, a militant black dude with a hatred of white people played awesomely by Ving Rhames, Steve Buscemi pops up as mass murderer Garland Greene, who questionably gets away scot-free at the end despite, and I quote, ‘driving through 3 states wearing a little girls head as a hat.’ Other actors include Colm Meaney, Danny Trejo, Dave Chappelle and John Cusack. Cusack is one of the best characters in the film, playing U.S Marshall Vince Larkin and turns in the kind of great performance that made him great in the brilliant Grosse Pointe Blank. Con Air is similar to many other Cage films and 80’s and 90’s action films in general; it’s endlessly quotable. There are some great lines in the film (BIlly: You lost your mind? Cyrus: According to my last psych evaluation, yes.) And there are some terrible ones, (Cage: She’s my hummingbird.) But they’re all awesome in the context of the film and the really add to its over the top nature. The action in Con Air is perhaps the real highlight and in that case it really delivers. The action is original, well scripted, violent, funny and extremely enjoyable. A highlight would be the scene at the airfield where multiple things are happening. The convicts ambush the police who are coming to get them, meanwhile Nicolas Cage is looking for a hypodermic needle to administer insulin to his dying friend and John Cusack is trying to not get shot and help out the police. This is all followed by an awesome fight within the plane after it takes off, culminating with an emergency landing on the Vegas Strip. That is then followed by a Police motorbike vs firetruck chase through Las Vegas, filled with explosions, violence and Nicolas Cage. While the whole film is awesome, these last 35-40 minutes make Con Air defiantly worth watching. 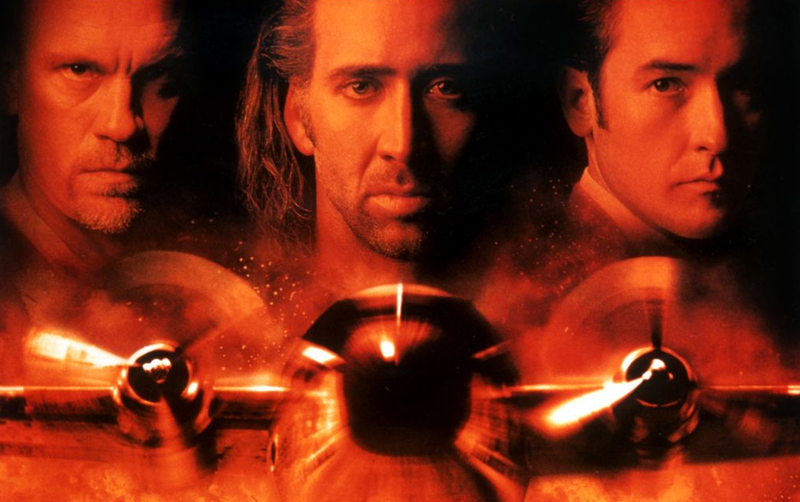 The Bottom Line: Con Air is the second of Nicolas Cage’s 90’s action film trilogy and it’s an easy one to recommend. It has brilliant action, awesome dialogue, stupid accents, and one of Nicolas Cage’s Cage-y performances. There isn’t a single dull moment in the entire film and an all-star cast rounds it all off. Of course the film is often stupid, but if you like your action films violent, funny and full of Nicolas Cage then look no further than Con Air.